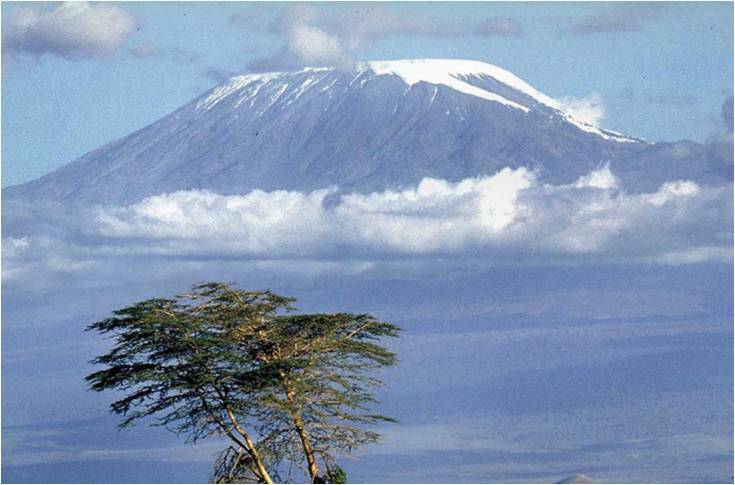 Take up the challenge of summiting Africa’s highest peak and the highest free standing mountain in the world. Trekking up Mount Kilimanjaro is a truly life changing experience and the great thing is, anyone with moderate fitness can make the top! 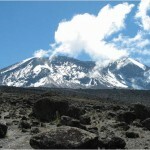 The Rongai route is the only northern approach to Kilimanjaro and is often one of the less populated routes. 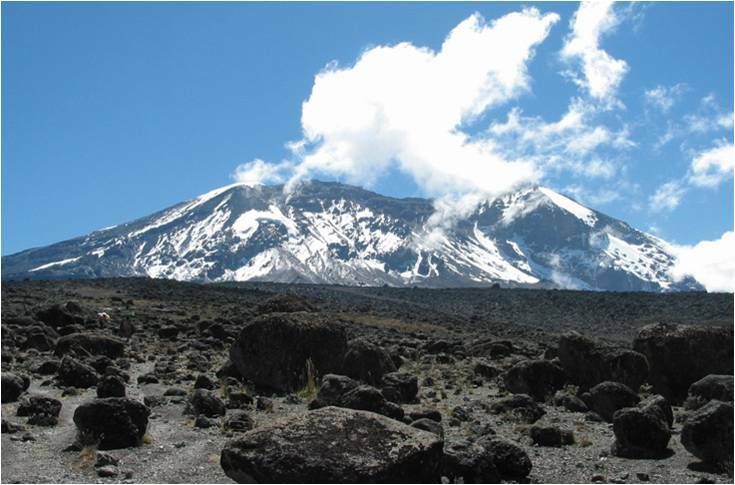 Rongai offers a true wilderness experience on the early stages of the climb and allows less acclimatisation opportunities than some of the other routes and the final summit attempt is also considered fairly hard going. 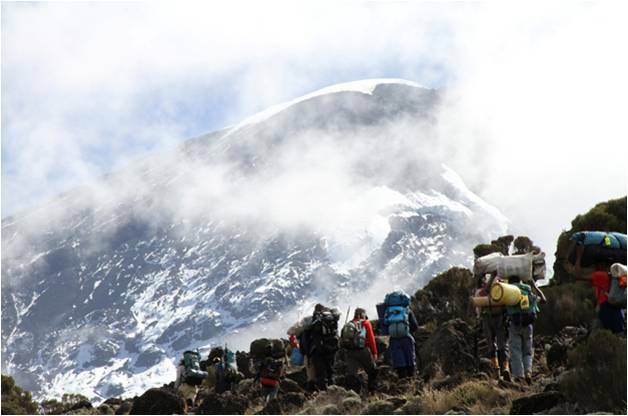 So if you’re looking for a challenging African Adventure look no further than Trekking Mount Kilimanjaro via the Rongai Route! Project Type: Overland Tour, Trek – 8 Days. Pick Up Point: Moshi, Tanzania. Price: from £1,349 per person sharing (Includes all local payments). Start Dates: All year round, please contact us for exact departure dates. 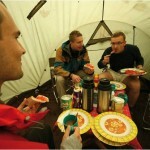 Accommodation: Camping in tents whilst on trek. Meals: As detailed in itinerary. 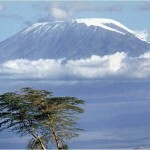 Moshi is the gateway to Mount Kilimanjaro and the meeting place for trekking expeditions. Today we meet and are briefed about the climb and if the weather is favourable, catch a glimpse of the world’s tallest freestanding mountain.(5895m). 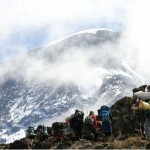 The Rongai Route is known as one of the most scenic ways to climb Kilimanjaro. If you are making your own way to Moshi, please advise of your estimated arrival time to organize the briefing. It is a 4-5 hour transfer from Moshi to the National Park Gate near the village of Rongai at 1990m. After signing in and preparing the porters, we begin the hike on a wide path, which winds through fields of maize and potatoes, before entering pine forest. The Path climbs 9km consistently through the attractive forest that shelters a variety of wildlife. 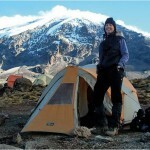 Here we stop over for lunch, and admire the superb views of Kibo Crater and the eastern ice fields on the crater rim. From the Second Cave we turn left towards the jagged peaks of Mawenzi, covering 10km as we cross the moorland towards Kikelewa Camp, located at 3 630m in a sheltered valley. A Short but steep climb up grassy slopes is rewarded by superb all round views and a tangible sense of wilderness. We leave the vegetation behind shortly before reaching the next camp at Mawenzi Tarn, spectacularly situated in a cirque directly beneath the towering spires of Mawenzi. The afternoon is free to rest or explore the surrounding area whilst we acclimatize to the altitude. 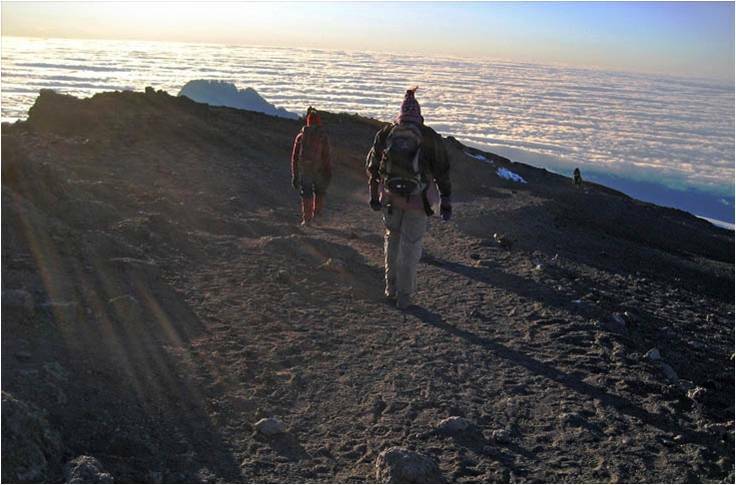 It is a 7km hike through the lunar desert of the ‘Saddle’ between Mawenzi and Kibo. 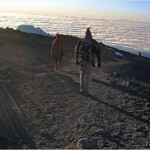 The Kibo Campsite is at 4700m, at the bottom of the Kibo Crater wall. The remainder of the day is spent resting in preparation for the final ascent, it is advisable to have a very early night. We begin the final and by far the steepest day’s hiking at 11h30 pm, climbing by torchlight for the first part of the journey. We travel very slowly in the darkness as we are on a switchback trail over loose volcanic scree. When we reach the crater rim at Gillman’s Point, 5681m we enjoy the spectacular sunrise over Mawenzi. 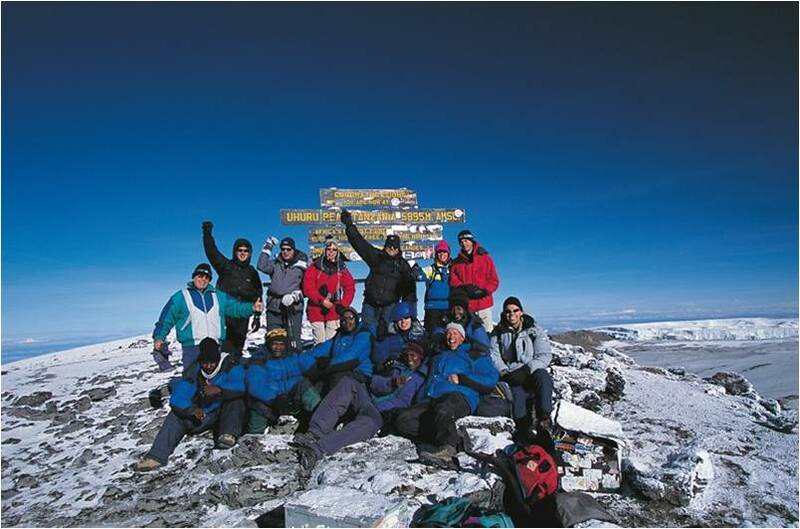 Those who are still feeling strong can make the 3 hour round trip to Uhuru Peak, passing close to spectacular glaciers, and ice cliffs, that still occupy most of the summit area. The 14km descent to the campsite at Horombo (3700m) is surprisingly fast. It is a steady descent down through moorland to Mandara Hut (2700m) where a hot lunch is prepared for you. You continue down through lush forest, on a good path to the National Park Gate at Marangu. At lower elevations it can be wet and muddy, gaitors and trekking poles will help. If you conquered the summit you can collect your summit certificate at the gate. Green for Gilman’s Point and gold for those that reached Uhuru Peak. Then we head back to Moshi for a hot shower and a well deserved rest. After breakfast the tour ends, please let us know if you require any further transport or accommodation. Meals as per itinerary, accommodation, registered guides, and transport as per itinerary. Please inform of any pre-existing medical conditions ie. Diabetes / Asthma. Please inform about any food allergies or physical disability that you or your client may have. These are your responsibility, most nationalities require visas for East African Countries. Although most nationalities can obtain their visa on the boarder it is highly suggested that you obtain it before arrival to save time. Due to the African Sun being very strong, please use a factor 30 sunscreen and wear a hat. During winter months it can also get very cold so must dress very warm. USD is the best Currency for East Africa. Traveller’s cheques are not considered as they can take very long to clear and often cause unreasonable problems and charges. Credit cards cannot always be processed especially in remote areas. It is advised to only have new USD notes and not the old style notes, as they won’t be accepted. Many places won’t accept USD 100 notes, so make sure to bring lots of USD 1, USD 5 and USD 10 notes for tips and craft markets. USD 20 and USD 50 notes are good to change into local currency. If you require accommodation, before or after your tour we can arrange this for you. We can also arrange airport transfers. Please be sure to arrive 1 day before your transfer is due to depart for tour. This will avoid any unforeseen problems. 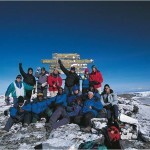 After the climb, it is customary to give tips to all the members of the mountaineering crew. Below are guidelines based upon a group (not per person). Guides – $12-$18 per day. Assistant Guide – $8 – $12 per day. Cook – $8 – $10 Per Day. Waiter – $7 – $9 Per day. Porter – $6 – $7 Per Day. 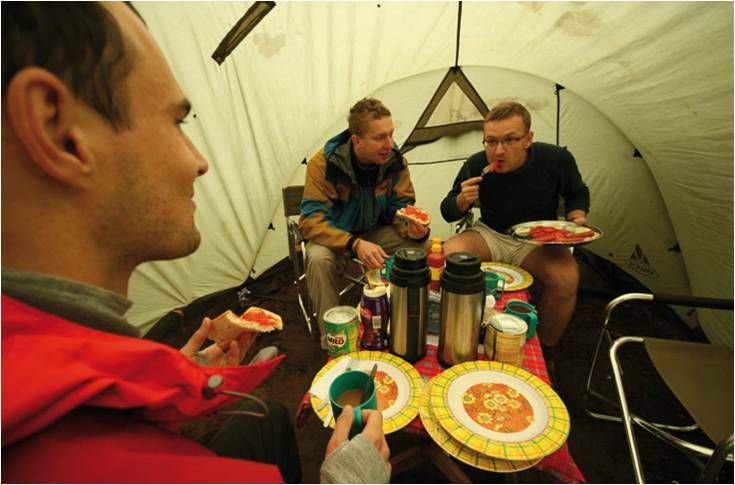 Tips make up a large proportion of the income of the mountaineering crew. If you are happy with the work that they have done, naturally you can give a little more. Our tours are for everybody as adventure travel isn’t limited to certain ages as in the past. It comes down to the individuals’ ability to join in and communicate with the other members of the group. That being said, from experience we can say that the broad average age of people on tour are from 20 – 35 years, although if you have to narrow this down it would be between 22 –25 years. 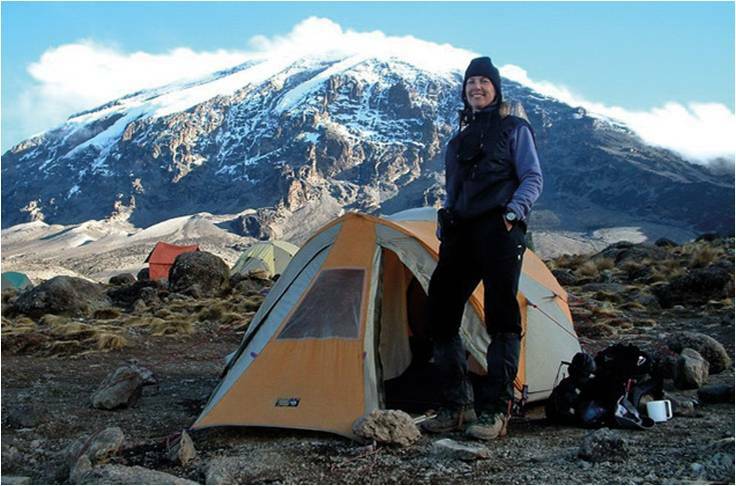 During your Kilimanjaro trek you will be accommodated for 2 nights in shared back-packer type accommodation, which is based yet comfortable. The 5 nights spent on trek you will be camping in twin sharing tents. Please note that not all camp sites have full bathroom facilities and all clients on camping tours are expected to bring their own sleeping bags and towel, a foam covered mattress is provided. Meals as indicated on the itinerary, accommodation, registered guide and transport.